Fig. 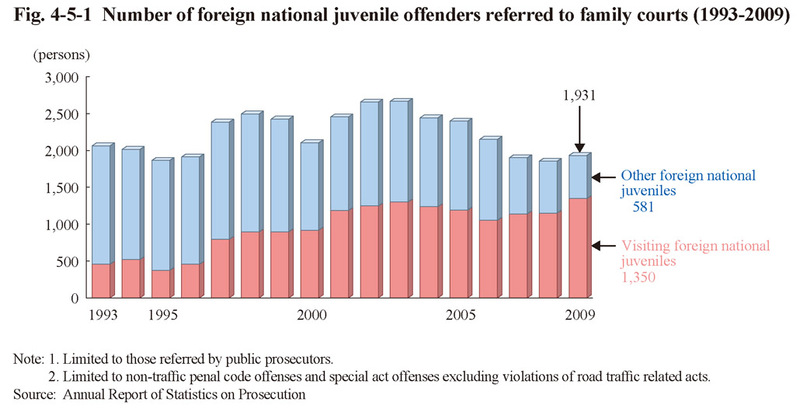 4-5-1 shows the number of foreign national juvenile offenders referred to a family court by public prosecutors (limited to non-traffic penal code offenses and special act offenses but excluding violations of road traffic related acts) over the last 17 years, with the data having been divided into visiting foreign national juveniles and other foreign national juveniles. Examining the number of visiting foreign national juvenile offenders referred in 2009 by nationality, etc. revealed that those from the Philippines were the largest in number at 299 (22.1%), followed by Brazil at 298 (22.1%), China (including Hong Kong (but limited to those with a passport issued by the Chinese government) and Taiwan) at 213 (15.8%), South/North Korea at 199 (14.7%), Peru at 124 (9.2%), and Vietnam at 42 (3.1%). By type of offense theft was the largest in number at 726 (53.8%), followed by embezzlement (including embezzlement of lost property, etc.) at 261 (19.3%), injury at 103 (7.6%), and robbery at 50 (3.7%) (Source: Annual Report of Statistics on Prosecution).